Former US secretary of education Arne Duncan’s two children are enrolled in the University of Chicago Laboratory Schools (Duncan is an alumnus himself), a prestigious private prep-school in the rich Hyde Park neighborhood founded in 1896 by the father of American progressive education John Dewey. So do Chicago Mayor Rahm Emanuel’s children, as did Obama’s children when they lived in Chicago. Tuition ranges from $27,384 to $30,618 from nursery to high school. “We ignite and nurture an enduring spirit of scholarship, curiosity, creativity, and confidence,” their mission statement goes. “We value learning experientially, exhibiting kindness, and honoring diversity.” There is a 10:1 student-teacher ratio, an average class size of 18 in middle and high school, and an average class size of 23 in the nursery through fifth grade. Students take one standardized test in third, fourth, sixth, and eighth grades, but the purpose is only that it “gives teachers a snapshot of each child’s strengths and challenges,” rather than the whims of the education department or some testing corporation. Teachers, who are unionized, are not evaluated by test scores. When he was the director of the Lab Schools, David Magill condemned the corporatization of public education in a 2010 address to the faculty, “I believe that the ‘business model’ of improving education will fall on its own sword.… Measuring outcomes through standardized testing and referring to those results as the evidence of learning and the bottom line is, in my opinion, misguided and, unfortunately, continues to be advocated under a new name and supported by the current administration.” He said that Dewey’s legacy lives on as the school is still defined by the principles of experiential learning, reasoning, self-determinism, and community. Secretary of Education John King when he was New York State education commissioner sent his children to the Woodland Hill Montessori School. The school spans from toddlers to eighth graders with the top tuition rate at $13,250. On their site, the school captured their core goals for all students, such as “to encourage the self-motivation and self-discipline that will lead to a lifelong pursuit of knowledge,” “to instill in each child a sense of duty and personal responsibility for the world in which we live,” and “to spark in our children imagination, wonder, humor, and joy.” Students take some standardized tests, but the school “recognizes that standardized tests do not adequately measure the full range of a student’s academic abilities” and employs narrative evaluations too. Every one of these politicians from Obama to Duncan to Emanuel to King have had their children enrolled in schools outside the wrath of their own education policies. These progressive institutions have resolutely rejected corporate school reforms. We have politicians who lobby for high-stakes standardized testing, the busting of teachers unions, school closures, value-added teacher evaluations, drill-kill-bubble-fill instruction, and authoritarian classrooms, yet would never send their own kids to a school with such practices. In their worldview, small class sizes, play, experiential, hands-on learning opportunities, qualified, unionized teachers, lavish resources and facilities, and little to no standardized testing are only appropriate for the offspring of the rich and powerful. Progressive education has a long and distinguished history in the United States. Educators John Dewey and Francis Parker were its pioneers and in the first few decades of the twentieth century, the movement had gone from being “a tiny and, in many eyes, a crackpot movement quarantined in a handful of private schools,” as Time magazine put it in 1938, to one that impacted every school in some fashion. Then in the 1960s and early 1970s, the free school movement, whom many consider to be a more radical version of progressive education, picked up steam throughout the country. Progressive education is the antithesis of traditional education, our dominant model of education in public and private schools around the country. Progressive advocates seek to liberate schoolchildren from mind-numbing standardized classrooms. Progressive education is based on the following principles: educate the whole child; children should learn by doing, creating, and exploring; education should be based on the child’s passions and interests; holistic and qualitative assessments should be used to measure learning in lieu of grades and test scores; the classroom should be ingrained not divorced from the community; and teachers should act like facilitators and guides rather than being a “sage on the stage.” “Education,” posited Dewey, “is not preparation for life, but is life itself.” In my new book Schools On Trial, I argue that the essence of progressive education is two-fold: First is that it lets children be, think, and do for themselves; and second, it is founded on the belief that children are people too, and they have rights and opinions that need to be taken seriously and respected by adults. Today, there are thousands of progressive, innovative schools in the United States, including networks of Montessori, Waldorf, Deweyan, Sudbury, Big Picture, Expeditionary Learning, and EdVisions Schools. The problem is that many are private, so equity is a major challenge for this movement. For instance, in New York City, many of the progressive schools are occupied by children of affluent families, charge more than $30,000 in annual tuition fees per student, and have little racial diversity. 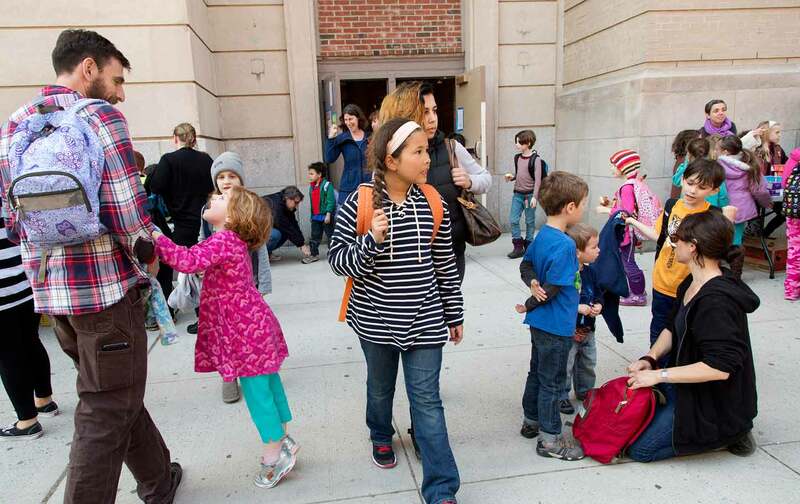 There are schools like Avenues: The World School, Blue School (started by the founders of the Blue Man Group), Calhoun, Dalton, Ethical Culture Fieldston School, and Little Red School House. I made brief visits to the Blue School and Calhoun and I found them to be wonderful, humane places of learning, but largely inaccessible to the kids who need this education the most: poor black and brown children. They are the ones who attend schools that feature metal detectors, police officers stationed in the building, dragnet surveillance, ironclad rules, routines, and dress codes, zero-tolerance disciplinary policies, mindless rote learning and test prep in classes, teachers and administrators who are underpaid and undertrained and who don’t look like their students or reside in their communities, inadequate resources, large class sizes, pernicious learning conditions, and lack of toilet paper, running water, libraries, counselors, and art, music, and sports facilities. These schools, which encompass public as well as charters, are places of control and compliance or for some, a one way ticket into the carceral state. Several poor African-American and Latino students in Philadelphia told me that in their former high schools students were forced to walk with their hands behind their backs in a single file line in the hallways. That is effectively grooming them for incarceration. Perhaps what they need is a radically different education—that is, progressive education. In reality, there are dozens of examples of successful progressive schools in communities of color, may it be the Brooklyn Free School, Mission Hill School in Boston, James Baldwin School in New York City, or the Workshop School in Philadelphia. One of the cornerstones of this type of education is that students are involved in real-world activities and experiences and using the community as the classroom where one participates and learns in the world of adults and professionals, thereby acquiring this necessary cultural capital and learning basic skills. Progressive education cannot just be for the white, rich, and powerful. Bringing this education to the most vulnerable would require political will, equitable funding of public education, major redistribution of wealth to the most underinvested communities, and mobilization of working-class people demanding change. In recent years, scores of educators and policymakers have contended that poor youth of color deserve better than crumbling schools that function akin to obedience- and prison-training establishments. And of the youth I’ve spoken with, they want schools that view them not as threats to society but as passionate, original thinkers, and offer the same resources and opportunities that Obama’s, Duncan’s, Emanuel’s, King’s, and other members of the elite’s children are afforded.